African LCC group fastjet is expanding in the South African market in 2016, starting with the early Feb-2016 launch of flights to Johannesburg from Harare and Victoria Falls in Zimbabwe. Johannesburg will be the first international destination for fastjet Zimbabwe, which is assessing several international routes for 2016 as it expands its A319 fleet. fastjet is also aiming to launch an affiliate in Zambia in 2016 with services to Johannesburg from up to three Zambian cities. fastjet has been serving South Africa since Oct-2013 but currently only has one route: a daily flight on a Johannesburg-Dar es Salaam-Zanzibar routing. This is the second of two analysis reports on fastjet. This first instalment focused on the Kenyan market, where fastjet has recently launched services and is keen to expand further. This instalment will focus on Zimbabwe, South Africa and the overall outlook for the group. Tanzania-based fastjet launched its first foreign affiliate in Zimbabwe in Oct-2015. fastjet Zimbabwe has since been only operating domestic services from Harare to Victoria Falls, which it currently serves with three weekly flights. But fastjet Zimbabwe recently secured approvals to begin international flights to South Africa, enabling it to announce on 18-Jan-2016 the launch of flights from Harare and Victoria Falls to Johannesburg. fastjet Zimbabwe plans initially to serve Harare-Johannesburg with one daily flight from 1-Feb-2016, and Victoria Falls-Johannesburg with three weekly flights from 3-Feb-2016. As is the case with Kenya for fastjet Tanzania, South Africa is an essential market for the long term viability of fastjet Zimbabwe as South Africa is by far the largest international market from Zimbabwe. South Africa currently accounts for over half of total international seat capacity from Zimbabwe. There are currently almost 17,000 weekly seats between Zimbabwe and South Africa. 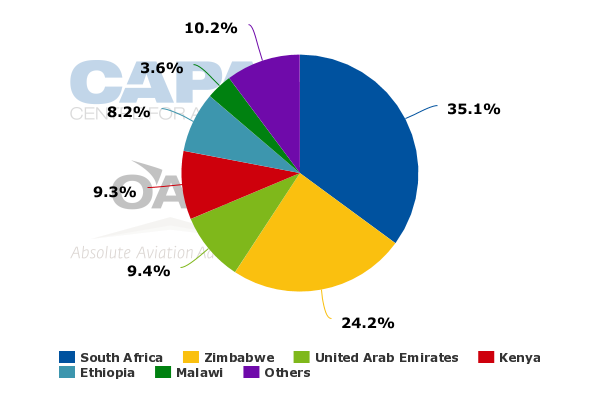 South African Airways (SAA) has a leading 60% share of capacity in the market while South African British Airways franchise airline Comair has approximately 18%, and Air Zimbabwe 22%. Comair currently operates one daily flight on Harare-Johannesburg, and five weekly flights on Victoria Falls-Johannesburg. Air Zimbabwe currently operates one daily flight on Harare-Johannesburg, three weekly flights on Victoria Falls-Johannesburg, and three weekly flights on Bulawayo-Johannesburg. The initial 10 weekly flights will give fastjet around a 15% share of seat capacity between Zimbabwe and South Africa. Its share should increase by the end of 2016 as fastjet Zimbabwe adds more flights to South Africa, starting with an anticipated second frequency to Johannesburg. fastjet again gives the Zimbabwe-South Africa market an LCC option following the suspension of services by flyafrica.com Zimbabwe in Nov-2015. flyafrica.com Zimbabwe became the first airline under the flyafrica.com group to launch services in Jul-2014, when it commenced flights from Victoria Falls to Johannesburg. Services from Harare to Johannesburg and Victoria Falls were added in late 2014. In 2015 flyafrica.com Zimbabwe launched services from Bulawayo to Johannesburg and from Harare to Lusaka in Zambia. Meanwhile sister airline flyafrica.com Namibia commenced operations in 2016 with flights from its Windhoek base to Cape Town and Johannesburg. The Namibian affiliate also was planning to link Johannesburg with Lusaka using fifth freedom rights, but was unable to launch this sector prior to suspending operations. 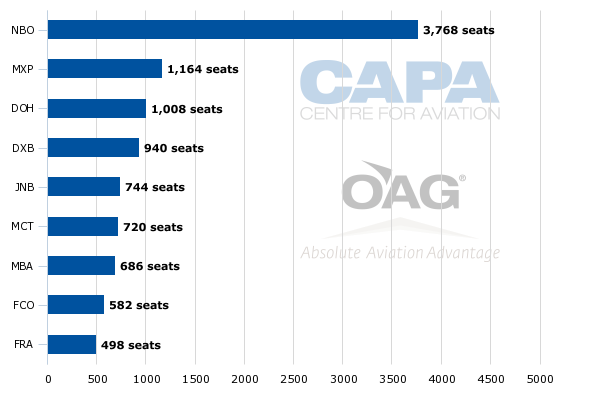 In Oct-2015 flyafrica.com Zimbabwe had an approximate 22% share of seat capacity in the Zimbabwe-South Africa market. At its peak it had over 5,000 seats in the Zimbabwe-South Africa market, with services on three routes. The flyafrica.com Zimbabwe suspension should make it easier for fastjet Zimbabwe to compete and expand in the Zimbabwe-South Africa market. Fares in the Zimbabwe-South Africa market increased after flyafrica.com Zimbabwe’s suspension, but should now again become more affordable as fastjet enters the market with one-way fares starting at USD80 (excludes taxes of USD35 for departures from South Africa and USD50 for departures from Zimbabwe). The fastjet group is now seeking a second A319 for its Zimbabwe affiliate to support more flights to South Africa and potential new international destinations. The initial 10 weekly South Africa flights and three weekly domestic flights will be supported by the current one aircraft fleet. In addition to Kenya, fastjet Zimbabwe is evaluating several potential new international destinations including Botswana, the Democratic Republic of Congo, Malawi and Zambia. The proposed Harare-Nairobi route, which could be launched in 2016, was analysed as part of the first instalment in this series of reports on fastjet as it is part of the group’s strategy for expanding its presence in the strategically important Kenyan market. While Zimbabwe is a relatively small market, fastjet believes it is underserved and can potentially support several new international routes with low fare stimulation. Harare-Nairobi is now only served by Kenya Airways with 10 weekly flights, Harare-Gaborone route (Botswana) by Air Botswana with three weekly turboprop flights, and Harare-Blantyre (Malawi) with two weekly Air Malawi flights. Harare-Lilongwe (Malawi) is only served with limited fifth freedom flights from Ethiopian and Kenya Airways. Harare-Lusaka is served by Air Zimbabwe and fifth freedom flights from several airlines including Air Namibia, Air Zimbabwe, Emirates, Ethiopian, Kenya Airways and Malawian. There are currently no non-stop flights connecting Harare with the Democratic Republic of the Congo, although flyafrica.com had been planning to operate Harare-Lubumbashi. fastjet has similar aspirations to operate several international routes from neighbouring Zambia, where it continues the process of seeking an air operators’ certificate (AOC). The fastjet group began the process of establishing an affiliate in Zambia two years ago, but has since encountered regulatory delays. Zambian authorities have proceeded slowly, in part because Zambia is in the process of upgrading its oversight capabilities in hopes of persuading EASA to remove Zambia from its blacklist. fastjet Zambia considers itself a test case for a new stricter system being implemented by Zambian authorities, and is confident it should finally be able to launch in 2016.
fastjet Zambia will initially operate in the Zambian domestic market, with flights likely connecting the capital Lusaka with Livingstone and Ndola. As was the case with fastjet Zimbabwe, fastjet Zambia will be keen to launch international services as soon as possible, starting with South Africa. 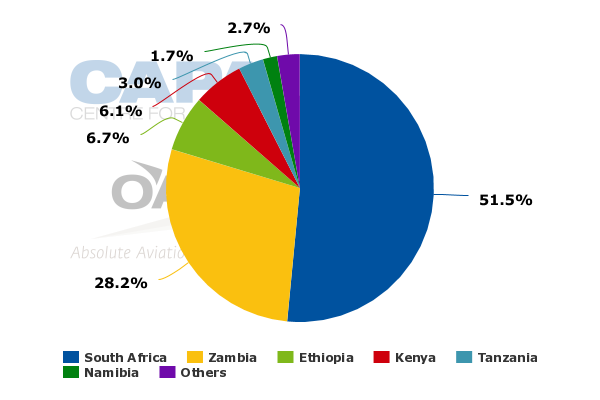 South Africa is the largest market from Zambia, currently accounting for approximately 35% of total international seat capacity. fastjet Zambia is keen to serve Johannesburg from Lusaka, Livingstone and Ndola. All three routes could potentially launch in 2016, giving fastjet a significant presence in the Zambia-South Africa market. SAA is the largest airline in Zambia’s international market and currently operates up to five daily flights on Lusaka-Johannesburg, two daily flights on Ndola-Johannesburg, and one daily flight on Livingstone-Johannesburg. Comair (under the British Airways code) also operates one daily flight on Johannesburg-Livingstone, but does not serve Lusaka or Ndola. Rwandair is currently SAA’s only competitor on Lusaka-Johannesburg but has only three weekly fifth freedom frequencies, as part of a flight that originates in Kigali. Interair South Africa competes with SAA on Ndola-Johannesburg but has only two weekly frequencies. Zambian regional airline Proflight only operates one route to South Africa, an exclusive three times per week service from Lusaka to Durban. With fastjet Zimbabwe, and subsequently fastjet Zambia, the fastjet group will be able to gradually build up a presence in South Africa. fastjet currently has only one daily flight in the South African market, from its original base in Dar es Salaam, but could have potentially more than 10 by the end of 2016. The one daily flight already makes fastjet the largest LCC in South Africa’s international market. SAA budget subsidiary Mango is now the only other LCC operating international flights from South Africa but has just one international route, a twice weekly flight from Johannesburg to Zanzibar. As fastjet expands its South African presence in 2016, in some respects it is filling the void left by flyafrica.com. In addition to the over 5,000 weekly seats that flyafrica.com provided in the South Africa-Zimbabwe market (as outlined earlier in this report), the flyafrica.com group had over 3,000 weekly seats in the South Africa-Namibia market. flyafrica.com also had unveiled plans to launch a daily service from Johannesburg to Lusaka, although never was able to commence the route prior to its Nov-2015 suspension. Johannesburg-Lusaka was to be launched as part of a fifth freedom sector on a planned second daily Windhoek-Johannesburg service, and would have lifted the flyafrica.com group’s total weekly seat capacity in the South African international market to approximately 12,000.
flyafrica.com’s strategy focused primarily on stimulating demand in South Africa’s international market, which has traditionally been underserved and unpenetrated by LCCs, resulting in extremely high fares. New South African airlines are generally unable to access this market as SAA – and to a lesser extent Comair – hold all available traffic rights for South African airlines. However, the traffic rights on the other end are generally not fully used, making the launch of affiliates in countries such as Namibia, Zambia and Zimbabwe appealing. fastjet can now pick up where flyafrica.com left off, by following a similar strategy of serving South Africa from multiple markets using its various affiliates. flyafrica.com proved that South Africa’s international market was ripe for low fare stimulation, but ultimately ran into legal challenges related to ownership and control. fastjet believes it has a more solid corporate structure, which will avoid the problems encountered by its former competitor. fastjet should be able to reach and potentially surpass 12,000 weekly seats in the South African international market by the end of 2016. This would give fastjet an approximate 10% share of capacity in South Africa’s regional international market, which would be second only to SAA. fastjet currently has only a 1% share of international capacity between South Africa and the rest of Africa. fastjet is only interested in routes of four hours or less, but routes of this length cover approximately 80% of total capacity in the South Africa-Africa market. In 2013 fastjet attempted to establish a South African affiliate. While the group would still be interested in a South African AOC, it has wisely put aspirations for a South African affiliate on the back burner, and is now focusing on serving as many international routes as possible into South Africa, using its various affiliates. fastjet would still need a South African AOC to operate within South Africa, which has Africa’s largest domestic market. However the domestic South African market is not a priority as it is already well served by LCCs. Over half of total LCC capacity within Africa is in the domestic South African market. Even with the late 2015 suspension of South African LCC start-up Skywise, South Africa has three domestic LCCs in Mango, Kulula and start-up FlySafair. Kulula and FlySafair do not operate any international services, while Mango has just the one international route to Zanzibar. fastjet will have three international routes from Johannesburg by early Feb-2016 with Dar es Salaam, Harare and Victoria Falls. The three routes should enable the group to build scale and improve its brand awareness in the South African market. fastjet is still relatively unknown in South Africa, as it has been limited to the relatively small Johannesburg-Dar es Salaam route. fastjet will likely launch several other routes to Johannesburg later in 2016, starting with Lusaka and Livingstone. Ndola, Bulawayo and Zanzibar are also possibilities for 2016. fastjet is also now evaluating the launch of services to South Africa’s second and third largest cities, Cape Town and Durban, from Zimbabwe and/or Zambia. fastjet is already experimenting with Johannesburg-Zanzibar services through a new extension of its Johannesburg-Dar es Salaam service to Zanzibar. fastjet re-entered the Zanzibar market on 11-Jan-2016 with 12 weekly flights from Dar es Salaam. The new flights are an opportunity for fastjet to gain a foothold in Zanzibar, a popular tourist destination, and evaluate potential international routes from Zanzibar, including Johannesburg and Nairobi. There are currently nine international routes from Zanzibar, with Nairobi by far the largest destination. However, there are only two other international routes within Africa from Zanzibar: Johannesburg and Mombasa. The other six routes are to the Middle East and Europe (as Zanzibar is a popular holiday destination for Europeans). fastjet served Zanzibar from Kilimanjaro in 2H2012 and early 2013, but has previously never competed in the Dar es Salaam-Zanzibar market. Initially fastjet was reluctant to operate from Dar es Salaam to Zanzibar as it is a very short hop of less than 100km that is more economically served by turboprops. Most passengers travelling between Dar es Salaam and Zanzibar opt for the ferry, which makes the crossing in as little as two hours. fastjet regards its new Zanzibar operation as an experiment in both the local Dar es Salaam-Zanzibar and Johannesburg-Zanzibar markets. Of the 12 weekly flights that fastjet operates from Zanzibar, seven continue onto Johannesburg. fastjet is selling Zanzibar-Johannesburg as a direct one-stop service, with passengers not disembarking in Dar es Salaam. fastjet is also able to sell domestic seats on the Zanzibar-Dar es Salaam leg, while the other five weekly Zanzibar flights rely entirely on point to point domestic sales. Even traffic generated from fastjet’s new interline with Emirates must clear immigration and collect their bags at Dar es Salaam before checking in separately with fastjet. fastjet is now discussing possible interline partnerships with other foreign airlines serving Dar es Salaam. fastjet’s domestic network – which now links Dar es Salaam with all four of Tanzania’s airports capable of accommodating jets – and its growing international network would be appealing to several foreign airlines. fastjet is also now using a GDS, enabling it to fly around the region passengers who are not from Africa, and may not otherwise be familiar with the fastjet brand. But only around 10% of the group’s sales are now generated outside Africa – through the GDS, the Emirates interline or its own website. fastjet wants to stick to a pure low cost model as much as possible. At least for now it is not keen to offer a transit product – even if a transit facility is opened by Dar es Salaam Airport. Hybridising can be tempting as it opens up opportunities for higher yields but it comes with a cost, and fastjet’s primary focus is on maintaining a very low cost base. This is a sensible strategy given its early stage of development. fastjet has proven that there are huge opportunities for growth on short haul routes within Africa by stimulating demand through low fares. However, fastjet’s journey since its late 2012 launch has been filled with challenges, particularly regulatory setbacks. The group has since accumulated operating losses exceeding USD200 million. fastjet has not yet reported financial figures for 2H2015 but the group certainly remained in the red as demand in Tanzania dropped significantly in the lead up to, and just following, the late Oct-2015 presidential elections. In 2016 there should be significant improvements as Tanzania stabilises following the change in government and the group starts to build up scale. The early Feb-2016 launch of services from Harare and Victoria Falls to Johannesburg is significant as it represents the group’s first international routes outside Tanzania, supporting its long term network strategy to connect the dots throughout Africa. South Africa is a strategically critical market for fastjet and will experience significant growth throughout 2016. As outlined in the first report in this series, Kenya is also a critical market for fastjet, and will experience growth following the 11-Jan-2016 launch of services to Kilimanjaro and Nairobi. fastjet doubled the size of its fleet to six aircraft in 2015, and opened a second base with the launch of fastjet Zimbabwe. 2016 will mean at least two, and perhaps several more, aircraft being added to the fleet and at least one more base with the anticipated launch of fastjet Zambia. fastjet is wisely now taking a flexible approach to fleet and network growth, having learned that it can be difficult making commitments or predictions given the regulatory environment in Africa. It has been a turbulent three years, but fastjet has emerged as Africa’s leading international LCC. The recent suspensions of flyafrica.com Zimbabwe, flyafrica.com Namibia and Skywise are setbacks for Africa’s fledging LCC sector. Africa, however, still has huge potential for LCCs. Consolidation was inevitable given the regulatory challenges. fastjet has so far survived, but has by no means thrived. 2016 could be a critical year as it attempts to leverage its first mover advantage, launch several new international routes, and carve out a sustainable role in a difficult region.